Wisconsin parks contain many wooded cross-country ski destinations, including Nine Mile Forest, in Wausau. Winter in Wisconsin isn’t just about snow; it’s about the fun memories made with family and friends during a magical time of year. Some of the best memories are made over a weekend getaway playing in the snow, warming up with hot cocoa and enjoying a crackling fire at the end of a laughter-filled day. Check out these suggestions to take advantage of the fun to be had during Wisconsin winters. Feel the rush of the wind as you zoom by beautiful Wisconsin winter scenery on a snow tube. The best part? You don’t have to leave the comfort of your seat. Snow tubing in Wisconsin is a fun-filled activity for all ages and abilities, no experience required. Visit Sunburst Winter Sports Park in Kewaskum and tube under the bright-blue Wisconsin skies or underneath the stars at what’s called the “World’s Largest Tubing Park.” With the ability to make their own snow, Sunburst has 42 tubing chutes that are always ready for fun. At Wilmot Mountain in Wilmot, race your way down one of the 1,000-foot-long tubing lanes, and let the winner get a hot chocolate at the brand-new lodge. Make everyone in the family happy at Cascade Mountain in Portage, with four snow tubing chutes, more than 30 downhill skiing runs, and a snowboarding park. If slow and steady is more your pace, Wisconsin has hundreds of picture-perfect cross-country ski trails. Make your way through the rolling hills of the snow-covered countryside or underneath a canopy of pristine forest. 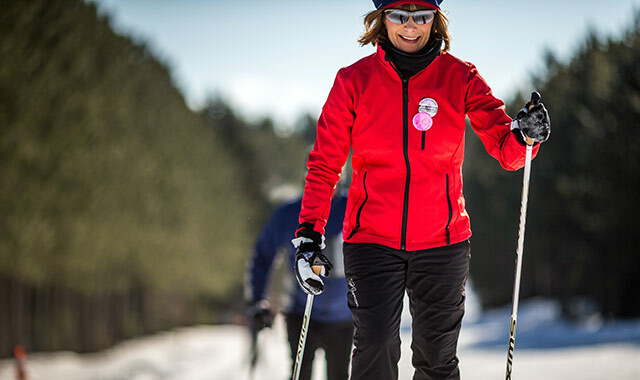 Whether you’ve never put on a pair of skis, or you live in them all winter long, Wisconsin offers more than 700 miles of trails for all skill levels. With so many to choose from, we recommend a couple that you won’t want to miss. Wisconsin’s state capital is ideal for a weekend of cross-country skiing at Governor Nelson State Park. Door County is home to five state parks, with enough trails to keep you busy and exploring all weekend long. The county’s Whitefish Dunes State Park is where you’ll journey through a beautiful wooded landscape. And, don’t miss the chance to ski by the flickering light of candles, during a candlelight ski night in one of Wisconsin’s state parks. Warm up this winter by renting your very own private cabin. With plenty of cabins for couples or families, Wisconsin is perfect for weekends away, while creating lasting memories. Walnut Ridge Log Cabin in Platteville is a charming, rustic log cabin that offers total privacy with pampering amenities, including a wood-burning fireplace, perfect for a romantic getaway. Families will love Woodside Ranch Resort in Mauston because there are so many activities for kids. Take a winter horseback ride through scenic wooded trails and relax in your own cabin at night. If an active getaway is what you seek, check out Christmas Mountain Village in the Wisconsin Dells, easily accessible to winter sports for the entire family. To discover plenty of other Wisconsin winter destinations, visit TravelWisconsin.com. Nearly 2,000 beer enthusiasts are expected at this year’s brewfest. One way to warm your blood this winter is with some casual imbibing. Dubuque, Iowa, offers several opportunities, starting with the fourth annual Dubuque on Ice Brewfest. 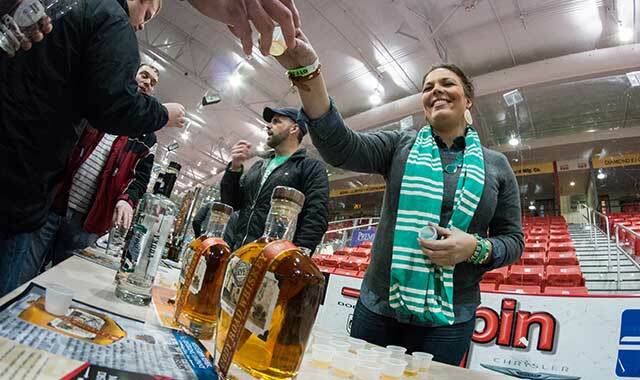 From 1 to 5 p.m. on Saturday, Feb. 21, craft beer lovers can enter the Mystique Community Ice Center, 1800 Admiral Sheehy Drive, to visit more than 30 brewers, taste more than 100 beers and sample local coffee blends, cheeses, sausages and chocolates. In the festival’s inaugural year, 450 people crowded the ice center mezzanine, and attendance has doubled each of the past two years, Kruser says. This year’s fest promises to be the largest yet, with 2,200 tickets available. Exhibitors will include local establishments like Galena Brewing Company and Great River Brewery of Davenport, Iowa, plus major U.S. craft breweries such as Goose Island, Stella Artois Cidre and Boston Beer Company. The fun continues with live music and a handful of games reminiscent of college days. Whoever can hold a full stein of beer in an outstretched arm the longest will win the Stein Hold challenge, and the fastest nail pounder will be crowned the Hammerschlagen champion. General admission is $35; designated driver tickets are $5. To learn more, visit dubuquebrewfest.com. If you can’t make it to the brewfest, here are three alternatives. The Potosi Brewing Company, located less than 30 minutes away in Potosi, Wis., is home to The National Brewery Museum, featuring beer and brewing memorabilia from across the country. The Potosi Brewing Company opened in 1852 and remained in business until 1972. Its buildings sat vacant for more than 20 years, until four local businessmen purchased them with restoration plans in mind. The community rallied the cause, and the Potosi Brewery Foundation was formed in 2000. Four years later, the town of Potosi beat out heavy-hitting beer cities like St. Louis and Milwaukee for the right to house the museum. American Breweriana Association members recognized the town’s brewing history and applauded its community support, Kruser says. Nearly 65,000 people visited the brewery and museum last year, and Kruser expects that number to rise when the brewery begins tours of its new bottling and kegging facilities in the spring. In July 2014, Dubuque welcomed Jubeck New World Brewing as its first nanobrewer – that is, a craft brewer on a tiny scale. Located in the downtown historic district, Jubeck truly is community-supported, evidenced by its creative beginnings. Startup costs were covered by donations made through Kickstarter, an online funding platform, as interested parties purchased advanced memberships in return for a share of the beer the brewery made, says president Jay Jubeck. It took three months to find a location – 115 W. 11th St. – and nine months to reconstruct the building, complete the proper licensing and start crafting beer. Now, the brewery offers patrons eight to 10 seasonal beers in a welcoming atmosphere. Jubeck’s small taproom is open from 4 to 11 p.m. on Thursdays, Fridays and Saturdays, but Jubeck hopes to expand those hours, and the selection, within the next year or two. What if you like a bit of wine with your beer? Take a look at Dubuque’s own Iowa Wine Tours, which offers daily tours to area wineries, but also provides an excursion for those with all-encompassing palates. The company’s special four-hour Winery/Distillery/Brewery Tour combines the best of three specialty beverages, with an educational tour of three facilities, tastings, on-site shopping, lunch and transportation on an Iowa Wine Tours bus. For more information on these and other Dubuque-area attractions, go to VisitDubuque.com. 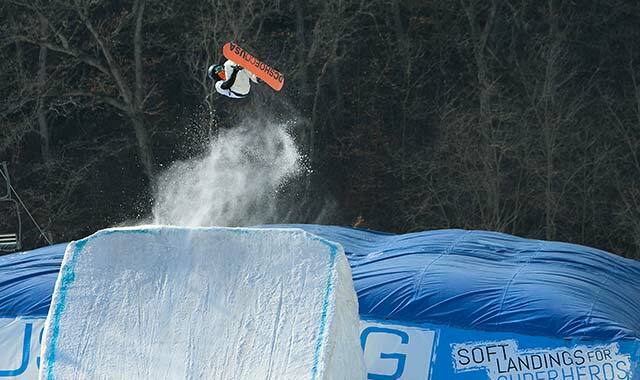 The sports park maintains a giant airbag – perfect for testing wild moves. Ski Snowstar Winter Sports Park, located just outside the Quad Cities, in Andalusia, Ill., has never had an identity issue. The 28-acre, outer space-themed resort is not extremely large, and doesn’t pretend to be. Instead, Snowstar focuses on its best qualities: being a family-friendly park that offers unique facilities, plenty of runs and extremely creative social events. Despite its size, Snowstar offers several amenities that larger resorts do not. Another distinctive trait of Snowstar is its giant airbag – an 8.5-foot-tall, 50-by-50-foot bag of air, with baffles, that offers the perfect landing pad for skiers and snowboarders practicing wild moves. The main activities at Snowstar remain downhill skiing and snowboarding, which take place on runs with names like Big Dipper and Outer Limits, though The Darkside terrain park attracts a fairly large crowd. The resort also offers the Little Dipper Learning Center, devoted entirely to beginners. Special kids’ programs and Women’s Wednesdays ensure that everyone learns at their own comfort level, Meyer says. Still, Snowstar might be best-known for its special events. The park’s For the Fun of It Races take place Monday evenings throughout February, and allow kids and adults alike to compete in downhill speed races. Snowstar also has a junior race team that travels the Wisconsin circuit, but the Monday night races are more of a social event for resort-goers, Meyer says. Toward the end of every season, Snowstar hosts its popular Slush Pit Splash V Snowbound Beach Party. The main attraction? A large ramp at the top of a hill that leads toward a big trough of water at the bottom. This year’s event will take place on Sunday, March 8, but the Slush Pit Splash doesn’t necessarily signify the park’s closure. If cold weather holds, the party continues at Snowstar, Meyer says. For more information on Ski Snowstar Winter Sports Park, visit skisnowstar.com. To discover other Quad Cities-area attractions, go to visitquadcities.com. Green Lake’s family-friendly ice fishing areas are a popular winter hangout. The lake is well-known for its population of Lake Trout. Green Lake, Wis., comes alive this time of year, with many winter activities on and around the state’s deepest natural lake. Last winter was an exceptional time to play outdoors around the ice – in this lakeside community, ice conditions were the best they’ve been in a generation. If you like snowmobiling and iceboat sailing, Green Lake is a fast and exciting place to be. Iceboats glide across the ice on many weekends, at speeds up to 60 mph, depending on ice and wind conditions. Green Lake’s regatta brings sailors from around the world, and lucky spectators could catch a ride. To get a glimpse of this wild ride, check out the Facebook page for the century-old Green Lake Ice Yacht Club. Green Lake County also boasts nearly 150 miles of groomed snowmobile trails, for those who prefer to keep their feet on solid ground. For up-to-date trail information, call the hotline at (920) 294-3220. 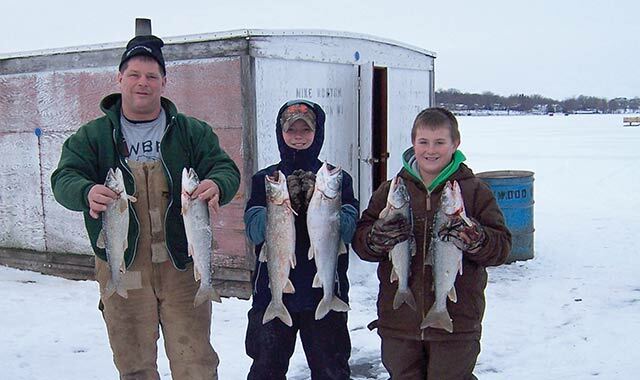 Don’t forget about ice fishing, which is a big part of Green Lake’s winter fun. Green Lake is famous for its population of Lake Trout, but it also yields many other fish as well. There are plenty of area guides who specialize in “hard water” fishing. You’ll be provided with transportation out to a heated cabin for the day, and with all of the equipment, bait and knowledge that you need to catch a trophy fish. The area also has plenty of snowshoeing and cross-country ski trails to explore, along beautiful, historic routes. Families can stop by Deacon Mills Park, borrow a free set of ice skates and enjoy the most beautiful lake skating rink around. When the snow and ice finally disappear, birding is a popular pastime in the area, where you’ll find many different sanctuaries within a short drive. Observe a wide variety of animal life around Green Lake itself, with its connected marshes and tributaries, or try to find some of the 300 kinds of birds at the famous Horicon Marsh Wildlife Area. The nearby Necedah National Wildlife Refuge is one of Wisconsin’s largest savanna restorations, and is home to more than 100 types of birds, plus numerous reptiles, butterflies and endangered species. Wind down after a full day of outdoor activities by visiting Green Lake’s own Evensong Spa, ranked among the top 100 spas of the world. Check out a live show at historic Thrasher Opera House in downtown Green Lake, which showcases a variety of acts from children’s theater and folk music to comedy and jazz. In late March, check out Heidel House Resort & Spa’s Brew Fest, where you can meet microbrewers from around the state, and sample more than 100 different styles. This winter, reconnect with your wild side in the great outdoors, and leave the closed-in air behind. Experience the Good Life in Green Lake, Wis.
For more information on any of these fun activities, contact the Green Lake Chamber of Commerce at (800) 253-7354, or see VisitGreenLake.com. 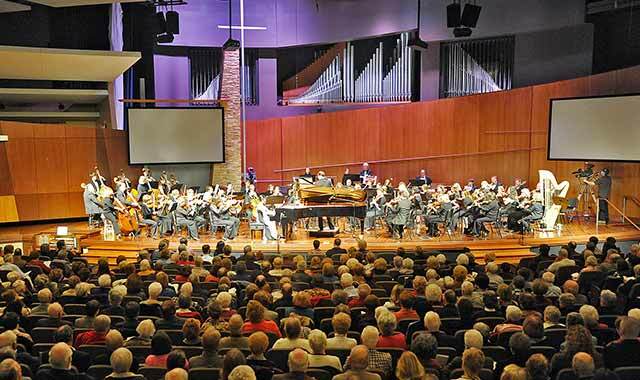 The Elmhurst Symphony Orchestra performs “Carnival of the Animals” at the Elmhurst Christian Reformed Church, on March 14 and 15. There’s no need to develop cabin fever as winter lingers on. Elmhurst, in eastern DuPage County, has several activities to keep you busy, both indoors and out, no matter what Punxsutawney Phil predicts for the weeks ahead. Both Irish-born and Irish-wannabes will attend Elmhurst’s St. Patrick’s Day Parade, now touted as the second largest such parade in the Chicago area. The parade kicks off at noon on March 7, at the intersection of Wilson Street and Spring Road, then continues north on Spring Road. Entertainers include the Elmhurst Armpit Orchestra and the City of Chicago Pipe Band. Seasoned paradegoers will grab a spot early, because 24,000 spectators packed the streets last year, says Jim O’Connor, who has been involved since the parade’s inception 19 years ago. “When it started, nobody had any conception of what this would turn into,” he says. The parade route starts in a residential area that’s full of family celebrations, and ends in Elmhurst’s business district, with people lining up in front of bars and restaurants to enjoy the remainder of the day. On Saturday and Sunday, March 14 and 15, the Elmhurst Symphony Orchestra presents “Carnival of the Animals” at Elmhurst Christian Reformed Church, 149 W. Brush Hill Road. The performances feature Camille Saint-Saëns’ “Le Carnaval des animaux,” a piece many have heard before, says Cynthia Bergquist Krainc, executive director of the symphony. For visual support, dancers from the DuPage Dance Academy and narrators from First Folio Theater Company in Oak Brook will perform. “We have a swan, a donkey, a kangaroo, an elephant, a tortoise, a lion,” says Krainc. The wide variety of animals provides many possibilities for the dancers to get creative. The Saturday evening show includes three additional pieces: “The Lark Ascending” by Vaughan Williams, “Divertissement” by Jacques Ibert and “Le Tombeau de Couperin” by Maurice Ravel. A shortened Sunday afternoon performance, geared toward children and families, includes “The Carnival of the Animals,” Krainc says. Before the show, Luscombe Music of Elmhurst will provide an instrumental “petting zoo,” allowing children to try different instruments. For more information, visit elmhurstsymphony.org. When the kids become restless, take them outside for free ice skating and sledding at Eldridge Park, 363 W. Commonwealth Lane, part of the Elmhurst Park District. The park encompasses nearly 43 acres and includes a large lagoon where outdoor skating is allowed, so long as the lagoon ice remains 8 inches thick for a three-day span. The park district posts a green flag when the ice is open for skating; a red flag warns the ice is dangerous and the lagoon is closed. Skaters can check conditions online at epd.org. Eldridge Park – along with Berens Park and Crestview Park – also offers a lighted sledding hill for families to enjoy. All three parks close at 11 p.m.
For more information, call the Wagner Community Center at (630) 993-8901. Discover more Elmhurst destinations online at elmhurst.org. This entry was posted on Wednesday, January 28th, 2015 at 11:59 am	and is filed under Recreation & Destinations. You can follow any responses to this entry through the RSS 2.0 feed. Both comments and pings are currently closed.